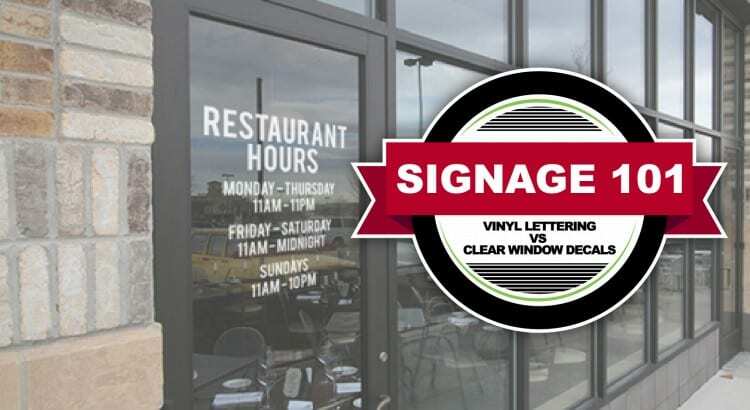 At Signs.com, we offer many products for dressing up your windows or storefronts. Two of our most popular products are clear window decals and cut vinyl lettering. While both look great on a window, it’s important to understand some major differences in the products. Knowing the differences between these two very similar products can make choosing the material that’s right for you a breeze. An example of a clear window decal. Looking very closely you can see that it is one cohesive piece. Clear window decals are signs with the design printed directly onto a sheet of clear material called Window Deco. They are printed as one piece of material, meaning that during installation the sign will be adhered to the window as one piece. Since the design is printed on the clear material, each individual letter or image does not adhere to the window separately. An example of a clear window decal. If you are unsure what parts of the decal will be printed clear and what parts will be printed in color, take a look at your design in our design tool. Clear is indicated by the gray and white checkered area on our site. If you want any part of your sign to be clear, that background must be visible on your proof. To get that checkered area, simply go to the color panel and select “Clear” while you have your whole sign (or the object you want clear) selected. If you have uploaded a JPG file to the site with a white background, we will print the white of that background. If you want that to be clear instead, please upload a PNG with transparency. If you need help, please fill out our free design request form. The checkered background indicates which portion of your window decal will be clear. An ‘optically clear’ window decal. 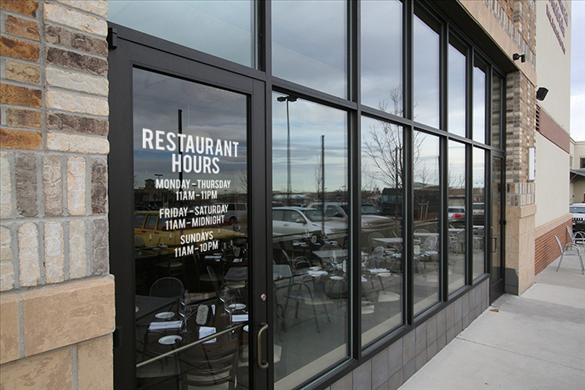 Clear window decals can be used both on the inside of the window (readable from the outside) or on the outside of the window. The type of application of the window decal depends on where the adhesive will be. For using the decal on the inside of the window, be sure the option for “Inside Glass” is selected. This will ensure that the adhesive is on the front of the decal, making it installable on the inside of the window, readable from the outside. With proper placement and care our clear window decals will last for three or more years in an interior application. For an exterior application, depending on the amount of exposure to the elements and other considerations the lifespan is one or more years. 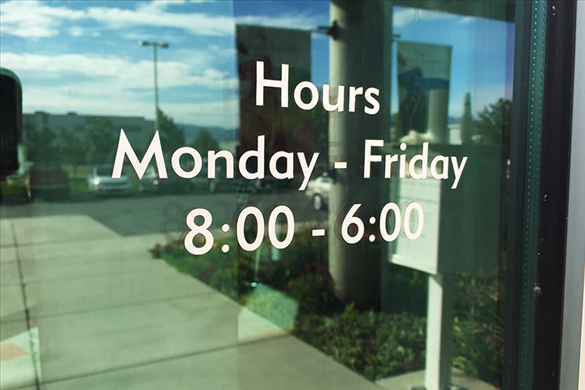 An example of store hours using vinyl lettering. While very similar in appearance, vinyl lettering has a much different production process than clear window decals. Vinyl lettering is a special adhesive vinyl that is cut directly from a piece of colored material. 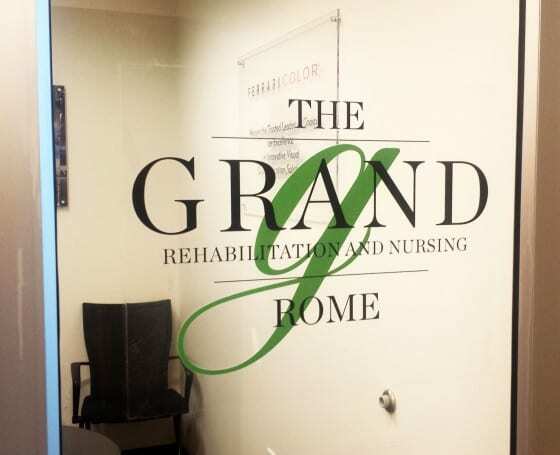 Unlike clear window decals which are printed to the exact color you need, the material for vinyl lettering only is available in certain colors. Because of this, we are only able to cut vinyl lettering in the fonts and art provided on our website. At this time we cannot cut logos, different fonts, or special designs from the vinyl lettering. 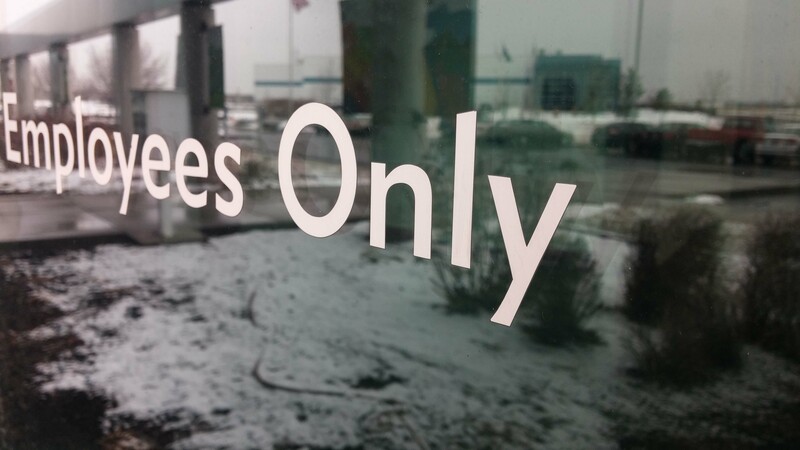 For signs with logos or complicated design elements, please order a clear window decal. 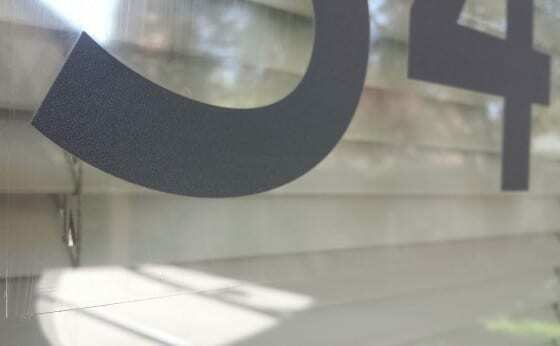 Because these letters are not printed, they are able to be adhered individually to the window without the clear background that comes with the clear window decals. All of our vinyl lettering comes pre-spaced with a masking transfer tape over the top that allows for easy installation. Simply install the sign as one piece, then remove the tape. 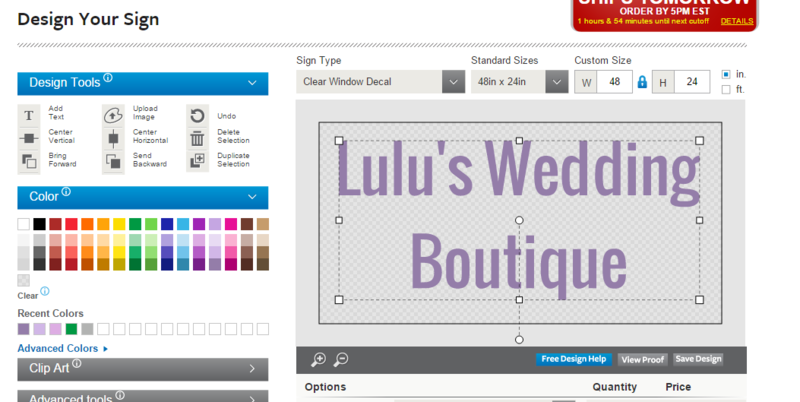 Your sign will look exactly as you see it pictured on our design tool. In other words, you will not need to place or adhere each individual letter to your preferred surface! In using clear window decals, the signs are printed and therefore can be printed with any color. When using vinyl lettering, each different color has to be individually cut out using complicated machinery. 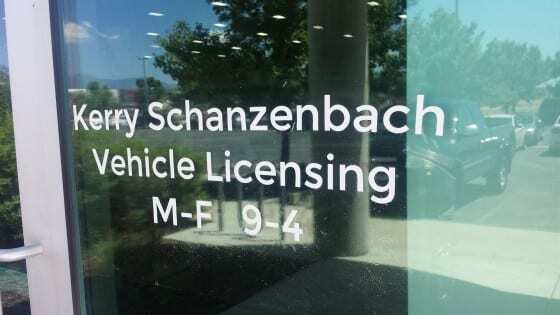 Because of this, having more than one color of lettering in your design does increase the cost of the sign slightly, a problem that does not happen when ordering a clear window decal. In addition, pricing for the vinyl lettering depends on the size and complexity of the lettering used. Pricing for clear window decals only depends on the size of the material and quantity ordered. Just like clear window decals, the vinyl lettering can be placed on the inside or the outside of a door or window. For using the decal on the inside of the window, be sure the option for “Inside Glass” is selected. This will ensure that the adhesive is on the front of the lettering, making it installable on the inside of the window, readable from the outside. Our vinyl letters will last 8-10 years with proper care and placement. This will of course vary some with the placement (inside lettering vs. outside or vehicle lettering), climate, etc. Of course, we want to ensure that you get exactly what you’re looking for! If you have any questions regarding vinyl lettering or clear window decals, give us a call or send us an email. We’d be happy to help in any way that we can. We also offer free design services to get your sign looking as professional as possible.